SSIS has some really awesome tasks to improve your ability to acquire, manage and push data about. The FTP Task isn't one of them. I cut my teeth with FTP on a command line so the limited options available via the native task are rather bothersome. Compound that with some of the other annoyances, like erroring when a file does not exist, you can see why I prefer to use a command file. In this example, we are going to access a publicly available ftp server using anonymous user and blank password. We'll download a file into our working folder and then delete it. As you might have observed throughout my postings, I really believe the power of SSIS comes through using Expressions. 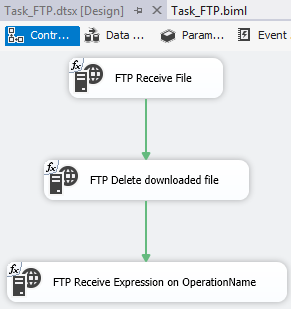 Something that surprised me was that as of this writing, I cannot use an Expression on the OperationName property of an FTP task. Well, I can apply one, but I have no idea what the text string that should go inside of one of those. Instead, by editing an existing package's operationg via Visual Studio and then viewing the resulting XML, I was able to discern the correlation between the displayed text and the underlying Operation numeric value. Name="FTP Receive Expression on OperationName"
A package is created with an FTP connection manager, expressions applied to it, and 3 FTP Tasks. A task is created to receive, GET, a file. 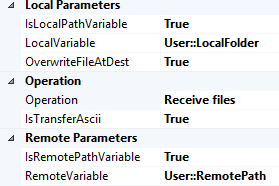 This operation type is set directly in the Biml as a Send but we later override it via Expresions. We're going to set the operation type by the numeric value of the Operation property. This step is identical to the first except in our application of Expressions. 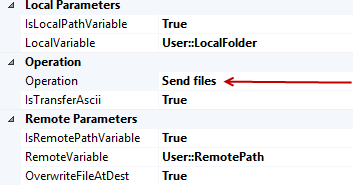 You'll observe the Operation remains "Send files" despite setting OperationName to either the value of "Receive" or "Receive files"